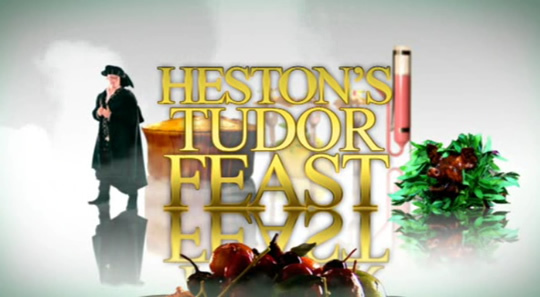 The latest episode of Heston's Feasts had Heston Blumenthal mining the Tudor era for recipes—one of the dishes from this episode was frog blancmange. 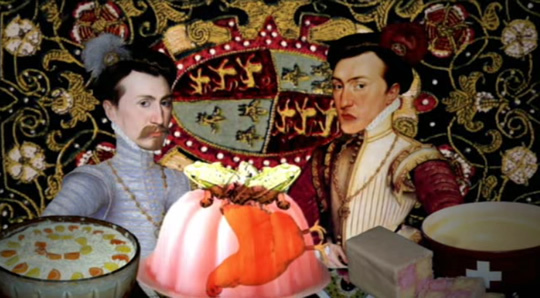 In Tudor England, blancmange was eaten as a savory dish, and not as a panna cotta dessert. 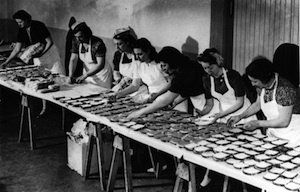 Typically it was packed with chicken meat, but during the 70 or so days a year when the eating of meat was prohibited by the Church, Tudors created an alternative — with frogs. Digging through period manuscripts, Blumenthal finds a recipe. The problem: he needs fresh, live frogs. So he goes to New York City, to Chinatown to find them, meeting up with man-about-Chinatown Ed Schoenfeld for help traversing the markets. From there, they head off to the kitchen of Chinatown Brasserie, and get the assistance of Joe Ng to work on the recipe. Not super happy with the blancmange alone, Blumenthal adopts Ng's fried frogs legs technique. For the final dish, he creates a frog habitat inside a hollowed out log, filled with an edible green gel, an almond-based frog blancmange, a period mushroom ketchup, violet flowers, rosewater, pomegranates, and the frogs legs on lilly pads.